While the reports are early, and my knowledge of French national politics and internal dealings is limited, it seems that the Left has taken control of the French Upper House, the Senate, for the first time since 1958 and the birth of the Fifth Republic. The recent results show that the Socialist Party and their allies, the Communists and the Greens, have formed an absolute majority against the Union for a Popular Movement/Union pour un Mouvement Populaire (UMP) dominated right. Early results show the left taking 23 seats from the right in an embarassing showing for Sarkozy, just seven months before the Presidential election. “The 25th of September, 2011, will go down in history”, claimed Jean-Pierre Bel, head of the Socialist group in the French Senate. But why is this? Surely, it was long-established fact that Sarkozy would lose out to Marine Le Pen, the enigmatic and attractive leader of the far-right Front National, a party consistently polling higher than Sarkozy’s UMP since its move to normalisation? Perhaps France isnt turning as hardline rightist, isolationist, xenophobic, eurosceptic and nationalist as we imagined? Perhaps this is the French people drawing a line in the sand and disassociating themselves from the Right? Perhaps it IS a form of nationalism, a turning disapproving vote of euroscepticism against a bail-out-backing, federalist UMP? Perhaps it shows support for Dominique Strauss-Kahn? Perhaps it shows the FN are unable to motivate their supports to actually get out and vote? Or perhaps that they didn’t bother for mere Senate elections? Or perhaps it is more of a protest against the apparently endemic corruption in Sarkozy’s inner circle? Perhaps this is the nail in Sarkozy’s political coffin. Over the past 24 hours, the Libyan opposition has made major gains against Gaddafi‘s forces – under the cover of the no-fly zone. The cities of Ajdabiya and Brega, crucial outposts on the main highway along the coast, have been retaken. This makes a full attack on Benghazi difficult. There are also reports emerging that the rebels have retaken the city of Ras Lanuf, a crucial oil-supplying town. 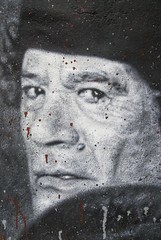 Hurting Gaddafi’s economy can only help in his (hopeful) eventual overthrow. What has changed? We changed. Thanks to the Western (and now Qatari) imposed no-fly zone over Libya, the rebels are benefitting from a huge boost in morale, knowing that the international community supports them, and from the no-fly zone grounding Gaddafi’s deadly air force. Apparently, Ajdabiya was taken mostly because of the RAF. 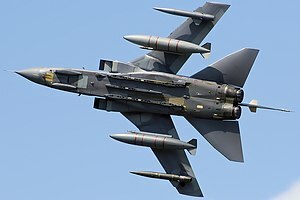 A devastating bombardment of the city by RAF Tornadoes led to Gaddafi’s forces melting away. The French air force has also been suppressing Gaddafi’s air force around Misurata, a city besieged. It took down, reportedly, three planes and two helicopters last night. So, that’s the latest updates on Libya. A clear change of fortunes for the rebel forces, that we can only hope will continue. BBC News – Gaddafi loyalists standing firm in Libya. Fascinating new video from the BBC. Who gave us the right to intervene? The rebels, the international community and morality. The rebels invited us to help them in their struggle for freedom. The international community came together, realised the need for intervention, and passed a legal mandate. They realise that instability in Libya, the region and the world, not only harms the people of Libya but us all, as we are all interconnected. Morality is out basis – it is wrong to stand by and allow crimes to take place when we could prevent them. If a man is being mugged in the street, you call the police, and if you’re strong, you help him against his assailant. It is right to attack his assailant, if it saves the innocent man. All we are doing, is defending the innocent from a thug. It is strange to still see so much support for Gaddafi but it’s understandable. If this sways you, wondering why we are invading, just look at the pictures of French flags being flown in Benghazi. They are all Libyans, and most know that Gaddafi must leave. Also: The United States has joined the conflict, firing Cruise missiles into Libya from a warship in the region. The war has come to Tripoli. Correction: The plane shot down over Benghazi was, as a minority of reports claimed earlier, flown by a rebel pilot, not Gaddafi loyalists.